The Mind of a Visionary! Almost two years ago upon my return from SAPPHIRE’05, a few colleagues asked. How was the event? My reply. Overall it was a good event. Most keynotes were as usual with bang, however, Shai’s ‘keynote’ sounded much more of a ‘recital’. 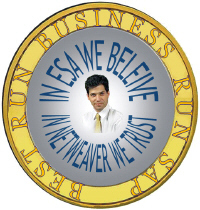 I sensed then that the euphoria of NetWeaver implementation is wearing down the ‘Mind of a Visionary.’ Real implementation of NetWeaver, though will be a great success, is a long proposition and the visionary mind of Shai just could not ‘recite’ the same ‘slides’ over and over, year after year to almost the very same crowd. A full scale Services Oriented SAP implementation will span over several years of hard-work with many years of coexistence with good old R/3 ‘modules.’ This long path was just too much of ‘ESA’ regurgitation for a visionary mind. SAP now has a good platform and solid ‘module’ oriented ‘German-disciplined-team’ that will provide a rock solid SAP/ESA solutions in the years to come. And for now, the ‘Mind of a Visionary’ is getting ready for his next big swim in the uncharted waters of a more pressing challenge facing the world today, the Energy and Climate Change. And I am sure the ‘Mind of a Visionary’ will be back in full speed and ready to ‘chew’ long new ‘food for thoughts’ and that outcome will make significant difference for the generations to come, much more than the ESOA.